Mercury is the innermost and smallest planet in the solar system, orbiting the Sun once every 88 days. Its brightness ranges from about -2.0 to 5.5 in apparent magnitude, but it is most often lost in the Sun's glare and becomes visible only in twilight. Comparatively little is known about the planet: the only spacecraft that has approached Mercury thus far was Mariner 10, from 1974 to 1975, which mapped only 40 to 45 percent of the planet's surface. This planet is heavily cratered and appears similar to the Moon. It has no natural satellites and no substantial atmosphere. It is believed to have a large iron core, which generates a magnetic field about 1 percent as strong as that of the Earth. Surface temperatures on Mercury range from about 90 to 700 Kelvin (K) (-180 to 430 °C), with the subsolar point (the point on the planet where the Sun would appear directly overhead) being the hottest and the bottoms of craters near the geographical poles being the coldest. The ancient Romans named the planet after the fleet-footed messenger god Mercury, probably for its fast apparent motion in the twilight sky. The astronomical symbol for Mercury (displayed at the top of the infobox on the right) is a stylized version of the god's head and winged hat atop his caduceus, an ancient astrological symbol. Before the fifth century B.C.E., Greek astronomers believed the planet to be two separate objects: one visible only at sunrise, the other, only at sunset. In India, the planet was named Budha, after the son of Chandra (the Moon). The Chinese, Koreans, Japanese, and Vietnamese cultures refer to the planet as the water star, based on the five elements in Chinese philosophy. The Hebrews named it Kokhav Hamah, meaning "the star of the hot one" ("the hot one" being the Sun). Mercury is one of the four terrestrial planets, meaning that like the Earth, it is a rocky body. It is the smallest of the four, with a diameter of 4,879 kilometers (km) at its equator. It is thought to be made up of approximately 70 percent metallic and 30 percent silicate materials. The planet's density, estimated at 5,430 kilograms per cubic meter (kg/m3), is the second highest among the various bodies of the solar system, being only slightly less than Earth's density. Mercury's high density can be used to infer details of its inner structure. While the Earth's high density results partly from compression at the core, Mercury is much smaller and its inner regions are not nearly so compressed. Therefore, for it to have such a high density, its core must be large and rich in iron. Geologists estimate that Mercury's core occupies about 42 percent of its volume (by comparison, Earth's core occupies about 17 percent of its volume). 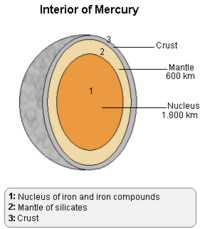 Surrounding the core is a 600-kilometer mantle. Mercury's crust is thought to be about 100–200 kilometers thick. One distinctive feature of Mercury's surface is the presence of numerous ridges, some extending over several hundred kilometers. 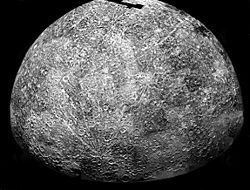 It is believed that these were formed as Mercury's core and mantle cooled and contracted after the crust had solidified. Mercury has a higher iron content than any other major planet in the Solar System. Several theories have been proposed to explain its high metallicity. The most widely accepted theory is that Mercury originally had a metal-silicate ratio similar to common chondrite meteors, and a mass approximately 2.25 times its current mass; but that early in the solar system's history, Mercury was struck by a planetesimal (a solid object formed during the accumulation of planets) with approximately one-sixth that mass. The impact would have stripped away much of the original crust and mantle, leaving the core behind. A similar theory ("giant impact theory") has been proposed to explain the formation of Earth's Moon. Alternatively, Mercury may have formed from the solar nebula before the Sun's energy output had stabilized. The planet would initially have had twice its present mass. But as the protosun (the Sun in its formative stages) contracted, temperatures near Mercury could have been between 2,500 and 3,500 K, and possibly even as high as 10,000 K. Much of Mercury's surface rock could have vaporized at such temperatures, forming an atmosphere of "rock vapor, which could have been carried away by the solar wind. A third theory suggests that the solar nebula caused drag on the particles from which Mercury was accreting, which meant that lighter particles were lost from the material coming together. Each of these theories predicts a different surface composition of the planet. Two upcoming space missions, MESSENGER and BepiColombo, are aimed at making observations that will allow these theories to be tested. During and shortly after the formation of Mercury, it was heavily bombarded by comets and asteroids for a period that ended 3.8 billion years ago. During this period of intense crater formation, the planet received impacts over its entire surface, facilitated by the lack of any atmosphere to slow impactors down. During this time, the planet was volcanically active. Basins were filled by magma from within the planet, which produced smooth plains similar to the maria on the Moon. Craters on Mercury range in diameter from a few meters to hundreds of kilometers across. The largest known crater is the enormous Caloris Basin, with a diameter of 1,300 kilometers. The impact that created the Caloris Basin was so powerful that it caused lava eruptions and left a concentric ring over 2 km tall surrounding the impact crater. At the antipode (diametrically opposite point) of the Caloris Basin is a large region of unusual, hilly terrain called the "Weird Terrain." It is thought that shock waves from the impact traveled around the planet and, when they converged on the antipodal point of the impact, caused extensive fracturing of the surface there. The so-called "Weird Terrain" was formed by the Caloris Basin impact at its antipodal point. The plains of Mercury have two distinct ages: the younger plains are less heavily cratered and probably formed when lava flows buried earlier terrain. One unusual feature of the planet's surface is the numerous compression folds that crisscross the plains. It is thought that as the planet's interior cooled, it contracted and its surface began to deform. The folds can be seen on top of other features, such as craters and smoother plains, indicating that they are more recent. 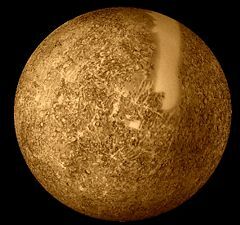 Mercury's surface is also flexed by significant tidal bulges raised by the Sun—the Sun's tides on Mercury are about 17 percent stronger than the Moon's on Earth. The surface of Mercury, like that of the Moon, has probably incurred the effects of space weathering processes. Solar wind and micrometeorite impacts can darken the albedo and alter the reflectance properties of the surface. The mean surface temperature of Mercury is 452 K (353.9 °F, 178.9 °C), but it ranges from 90 K (-297.7 °F, -183.2 °C) to 700 K (800.3 °F, 426.9 °C); by comparison, the temperature on Earth varies by only about 150 K. The sunlight on Mercury's surface is 6.5 times as intense as it is on Earth (with a solar constant value of 9.13 kW/m2). Despite Mercury's generally hot surface, observations strongly suggest the presence of ice on the planet. The floors of some deep craters near the poles are never exposed to direct sunlight, and temperatures there remain far lower than the global average. Water ice strongly reflects radar, and observations reveal that there are patches of very high radar reflection near the poles. While ice is not the only possible cause of these reflective regions, astronomers believe it is the most likely. The icy regions are believed to be covered to a depth of only a few meters, and contain about 1014–1015 kg of ice. By comparison, the Antarctic ice sheet on Earth weighs about 4 × 1018 kg, and Mars' south polar cap contains about 1016 kg of water. The origin of the ice on Mercury is not yet known, but the two most likely sources are from outgassing of water from the planet's interior or deposition by impacts of comets. Mercury is too small for its gravity to retain any significant atmosphere over long periods of time. It does, however, have a tenuous atmosphere that includes hydrogen, helium, oxygen, sodium, calcium, and potassium. The atoms of these atmospheric gases are continuously lost and replenished from a variety of sources. Hydrogen and helium atoms probably come from the solar wind, diffusing into Mercury's magnetosphere before later escaping back into space. Radioactive decay of elements within Mercury's crust is another source of helium, as well as sodium and potassium. In addition, water vapor is probably present, being brought to Mercury by comets striking its surface. Despite its slow rotation, Mercury has a relatively strong magnetic field—about 1 percent as strong as the Earth's. It is possible that this magnetic field is generated in a manner similar to Earth's, that is, by a dynamo of circulating liquid core material. Scientists, however, are unsure whether Mercury's core could still be liquid, although it could perhaps be kept liquid by tidal effects during periods of high orbital eccentricity. It is also possible that an earlier dynamo effect produced a magnetic field that became "frozen" in solidified magnetic materials. Mercury's magnetic field is strong enough to produce a magnetosphere that deflects the solar wind around the planet. This situation parallels that of the Earth, but contrasts with that of the Moon. In the case of the Moon, its magnetic field is too weak to stop the solar wind from impacting on its surface and so it lacks a magnetosphere. The orbit of Mercury is the most eccentric of the major planets, with the planet's distance from the Sun ranging from 46 to 70 million kilometers. It takes 88 days to complete the orbit. The diagram on the far left illustrates the effects of the eccentricity, comparing Mercury’s orbit with a circular path with the same semi-major axis. The planet's higher velocity near perihelion (orbital point nearest the Sun) is clear from the greater distance it covers in each five-day interval. 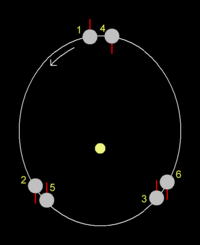 Mercury's orbit is inclined by seven degrees to the plane of Earth's orbit (the ecliptic), as shown in the diagram on the near left. As a result, an observer on Earth can see the transits of Mercury across the face of the Sun only when the planet is crossing the plane of the ecliptic at the time it lies between the Earth and the Sun. This occurs about every seven years on average. Mercury's axial tilt is only 0.01 degrees. This is over 300 times smaller than that of Jupiter, which has the second smallest axial tilt of all planets, at 3.1 degrees. This means an observer at Mercury's equator during local noon would never see the Sun more than 1/100 of one degree north or south of the zenith (highest point reached in the sky). An observer stationed at certain points on Mercury's surface would be able to see the Sun rise about halfway, then reverse and set before rising again, all within the same Mercurian day. This is because approximately four days prior to perihelion, Mercury's angular orbital velocity exactly equals its angular rotational velocity, so that the Sun's apparent motion ceases; at perihelion, Mercury's angular orbital velocity then exceeds the angular rotational velocity. Thus, the Sun appears to have retrograde motion (backward movement). Four days after perihelion, the Sun's normal apparent motion resumes. Mercury's orbit around the Sun exhibits a slow precession (spin axis direction changes in a circular motion). When it was discovered, this phenomenon could not be completely explained by Newtonian mechanics, and for many years it was hypothesized that another planet might exist in an orbit even closer to the Sun to account for this perturbation (another explanation postulated a slight oblateness of the Sun). The success of the search for Neptune based on its perturbations of Uranus' orbit led astronomers to place great faith in this explanation, and the hypothetical planet was even named Vulcan. In the early twentieth century, Albert Einstein's Theory of General Relativity provided a full explanation for the observed precession. Mercury's precession showed the effects of mass dilation (increase of mass), providing a crucial observational confirmation of one of Einstein's theoretical predictions. Mercury is slightly heavier at perihelion than it is at aphelion (point in orbit farthest from the Sun) because it is moving faster, and so it slightly "overshoots" the perihelion position predicted by Newtonian gravity. The effect is very small: the Mercurian relativistic perihelion advance excess is just 43 arcseconds per century. The effect is even smaller for other planets, being 8.6 arcseconds per century for Venus, 3.8 for Earth, and 1.3 for Mars. Research indicates that the eccentricity of Mercury's orbit varies chaotically from 0 (circular) to a very high 0.47 over millions of years. This is thought to explain Mercury's 3:2 spin-orbit resonance (rather than the more usual 1:1), because this state is more likely to arise during a period of high eccentricity. For many years it was thought that Mercury's rotation was tidally locked to be in synchrony with the Sun, such that it rotated once for each orbit, keeping the same face directed toward the Sun at all times—analogous to the manner in which the same side of the Moon always faces the Earth. However, radar observations in 1965 showed that the planet has a 3:2 spin-orbit resonance, rotating three times for every two revolutions around the Sun. The eccentricity of Mercury's orbit makes this resonance stable. The original reason astronomers thought it was synchronously locked was because whenever Mercury was best placed for observation, it was always at the same point in its 3:2 resonance, hence showing the same face. Due to Mercury's 3:2 spin-orbit resonance, a solar day (the period between two meridian transits of the Sun) lasts about 176 Earth days. A sidereal day (the period of rotation) lasts about 58.7 Earth days. Mercury's apparent magnitude of brightness varies between about -2.0 (brighter than Sirius) and 5.5. Yet our observation of Mercury is complicated by its proximity to the Sun, as it is lost in the Sun's glare for much of the time. Mercury can be observed for only a brief period during either morning or evening twilight. Mercury exhibits moonlike phases as seen from Earth, being "new" at inferior conjunction and "full" at superior conjunction. The planet is rendered invisible on both these occasions by virtue of its rising and setting in concert with the Sun in each case. The half-moon phase occurs at greatest elongation, when Mercury rises earliest before the Sun when at greatest elongation west, and setting latest after the Sun when at greatest elongation east (its separation from the Sun ranging from 18.5 degrees if it is at perihelion at the time of the greatest elongation to 28.3 degrees if it is at aphelion). 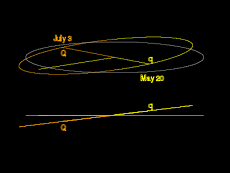 Mercury attains inferior conjunction every 116 days on average, but this interval can range from 111 days to 121 days due to the planet's eccentric orbit. 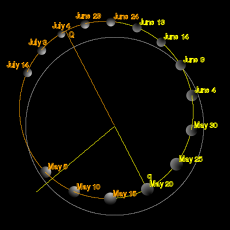 Its period of retrograde motion as seen from Earth can vary from eight to 15 days on either side of inferior conjunction. This large range also arises from the planet's high degree of orbital eccentricity. Mercury is more often easily visible from Earth's southern hemisphere than from its northern hemisphere. This is because its maximum possible elongations west of the Sun always occur when it is early autumn in the Southern Hemisphere, while its maximum possible eastern elongations happen when the Southern Hemisphere is having its late winter season. In both cases, the angle Mercury strikes with the ecliptic is maximized, allowing it to rise several hours before the Sun in the former instance and not set until several hours after sundown in the latter in countries located at South Temperate Zone latitudes, such as Argentina and New Zealand. By contrast, at northern temperate latitudes, Mercury is never above the horizon of a more-or-less fully dark night sky. Mercury can, like several other planets and the brightest stars, be seen during a total solar eclipse. Mercury is brightest as seen from Earth when it is at a gibbous phase, that is, between half-full and full. Although the planet is farther away from Earth when it is gibbous than when it is a crescent, the greater illuminated area visible more than compensates for the greater distance. The opposite is true for Venus, which appears brightest when it is a thin crescent. Mercury has been known since at least the third millennium B.C.E., when it was known to the Sumerians of Mesopotamia as Ubu-idim-gud-ud, among other names. The Babylonians (2000–1000 B.C.E.) succeeded the Sumerians, and early Babylonians may have recorded observations of the planet. Although no records have survived, late Babylonian records from the seventh century B.C.E. refer to much earlier records. The Babylonians called the planet Nabu or Nebu, after the messenger to the gods in their mythology. The ancient Greeks gave the planet two names: Apollo, when it was visible in the morning sky, and Hermes, when visible in the evening. However, Greek astronomers came to understand that the two names referred to the same body, with Pythagoras being the first to propose the idea. The first telescopic observations of Mercury were made by Galileo in the early seventeenth century. 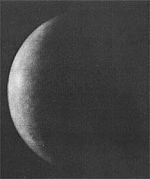 Although he observed phases when he looked at Venus, his telescope was not powerful enough to see the phases of Mercury. In 1631 Pierre Gassendi made the first observations of the transit of a planet across the Sun when he saw a transit of Mercury predicted by Johannes Kepler. In 1639 Giovanni Zupi used a telescope to discover that the planet had orbital* phases similar to Venus and the Moon. The observation demonstrated conclusively that Mercury orbited around the Sun. A very rare event in astronomy is the passage of one planet in front of another, as seen from Earth. This event is called occultation. Mercury and Venus occult each other every few centuries, and the event of May 28, 1737, is the only one historically recorded, having been seen by John Bevis at the Royal Greenwich Observatory. The next occultation of Mercury by Venus will be in 2133. The difficulties inherent in observing Mercury mean that it has been far less studied than the other planets. In 1800 Johann Schröter made observations of surface features, but erroneously estimated the planet's rotational period at about 24 hours. In the 1880s, Giovanni Schiaparelli mapped the planet more accurately and suggested that Mercury's rotational period was 88 days, the same as its orbital period due to tidal locking. This phenomenon is known as synchronous rotation and is also shown by Earth's Moon. The theory that Mercury's rotation was synchronous became widely held, and it was a significant shock to astronomers when radio observations in the 1960s questioned this belief. If Mercury were tidally locked, its dark face would be extremely cold, but measurements of radio emission revealed that it was much hotter than expected. Astronomers were reluctant to drop the synchronous rotation theory and proposed alternative mechanisms, such as powerful heat-distributing winds to explain the observations. In 1965, however, radar observations showed conclusively that the planet's rotational period was about 59 days. Italian astronomer Giuseppe Colombo noted that this value was about two-thirds of Mercury's orbital period, and proposed that a different form of tidal locking had occurred in which the planet's orbital and rotational periods were locked into a 3:2 rather than a 1:1 resonance. Data from space probes subsequently confirmed this view. Ground-based observations did not shed much further light on the innermost planet, and it was not until space probes visited Mercury that many of its most fundamental properties became known. 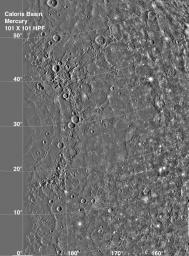 However, recent technological advances have led to improved ground-based observations: in 2000, high-resolution lucky imaging from the Mount Wilson Observatory 60-inch telescope provided the first detailed views of the parts of Mercury that were not imaged in the Mariner missions. Reaching Mercury from Earth poses significant technical challenges, since the planet orbits so much closer to the Sun than does the Earth. A Mercury-bound spacecraft launched from Earth must travel over 91 million kilometers into the Sun's gravitational potential well. Starting from the Earth's orbital speed of 30 kilometers per second (km/s), the change in velocity (delta-v) the spacecraft must make to enter into a Hohmann transfer orbit that passes near Mercury is large compared to other planetary missions. The potential energy liberated by moving down the Sun's potential well becomes kinetic energy; requiring another large delta-v to do anything other than rapidly pass by Mercury. In order to land safely or enter a stable orbit since the planet has very little atmosphere, the approaching spacecraft cannot use aerobraking and must rely on rocket motors. A trip to Mercury actually requires more rocket fuel than that required to escape the Solar System completely. Consequently, only one space probe has visited the planet so far. The only spacecraft to approach Mercury so far has been NASA's Mariner 10 (1974–1975). The spacecraft used the gravity of Venus to adjust its orbital velocity so that it could approach Mercury—the first spacecraft to use this gravitational "slingshot" effect. Mariner 10 provided the first close-up images of Mercury's surface, which immediately showed its heavily cratered nature, and also revealed many other types of geological features, such as the giant scarps that were later ascribed to the effect of the planet shrinking slightly early in its geological history. Unfortunately, the same face of the planet was lit at each of Mariner 10's close approaches, resulting in less than 45 percent of the planet's surface being mapped. The spacecraft made three close approaches to Mercury, the closest of which took it to within 327 kilometers of the surface. At the first close approach, instruments detected a magnetic field, to the great surprise of planetary geologists—Mercury's rotation was expected to be much too slow to generate a significant dynamo effect. The second close approach was primarily used for imaging, but at the third approach, extensive magnetic data were obtained. The data revealed that the planet's magnetic field is much like the Earth's, which deflects the solar wind around the planet. The Moon's magnetic field, on the other hand, is so weak that the solar wind reaches the surface. However, the origin of Mercury's magnetic field is still the subject of several competing theories. Just a few days after its final close approach, Mariner 10 ran out of fuel, its orbit could no longer be accurately controlled, and mission controllers instructed the probe to shut itself down. Mariner 10 is thought to be still orbiting the Sun, still passing close to Mercury every few months. A second NASA mission to Mercury, named MESSENGER (MErcury Surface, Space ENvironment, GEochemistry, and Ranging), was launched on August 3, 2004, from the Cape Canaveral Air Force Station aboard a Boeing Delta 2 rocket. It made a fly-by of the Earth in August 2005, and of Venus in October 2006 and June 2007 to place it onto the correct trajectory to reach an orbit around Mercury. A first fly-by of Mercury occurred on January 14, 2008, a second on October 6, 2008, and a third on September 29, 2009. Most of the hemisphere not imaged by Mariner 10 has been mapped during these fly-bys. The probe successfully entered an elliptical orbit around the planet on March 18, 2011. The first orbital image of Mercury was obtained on March 29, 2011. The probe finished a one-year mapping mission, and is now on a one-year extended mission expected to end in 2013. In addition to continued observations and mapping of Mercury, MESSENGER will observe the 2012 solar maximum. The mission was designed to clear up six key issues: Mercury's high density, its geological history, the nature of its magnetic field, the structure of its core, whether it has ice at its poles, and where its tenuous atmosphere comes from. To this end, the probe is carrying imaging devices which will gather much higher resolution images of much more of the planet than Mariner 10, assorted spectrometers to determine abundances of elements in the crust, and magnetometers and devices to measure velocities of charged particles. Detailed measurements of tiny changes in the probe's velocity as it orbits will be used to infer details of the planet's interior structure. Japan is planning a joint mission with the European Space Agency (ESA) called BepiColombo, which will orbit Mercury with two probes: one to map the planet and the other to study its magnetosphere. An original plan to include a lander has been shelved. Russian Soyuz rockets will launch the probes in 2013. As with MESSENGER, the BepiColombo probes will make close approaches to other planets en route to Mercury, passing the Moon and Venus and making several approaches to Mercury before entering orbit. The probes will reach Mercury in about 2019, orbiting and charting its surface and magnetosphere for a year. The probes will carry a similar array of spectrometers to those on MESSENGER, and will study the planet at many different wavelengths, including infrared, ultraviolet, X-ray and gamma ray. Apart from intensively studying the planet itself, mission planners also hope to use the probe's proximity to the Sun to test the predictions of General Relativity theory with improved accuracy. The mission is named after Giuseppe (Bepi) Colombo, the scientist who first determined the nature of Mercury's orbital resonance with the Sun and who was also involved in the planning of Mariner 10's gravity-assisted trajectory to the planet in 1974. ↑ R. A. Lyttleton, "On the Internal Structures of Mercury and Venus." Astrophys. Space Sci. 5 (1969): 18. ↑ P. Schenk and H. J. Melosh, "Lobate thrust scarps and the thickness of Mercury's lithosphere." Lunar Planet. Sci. 25 (1994): 1203. ↑ W. Benz, W. L. Slattery, and A. G. W. Cameron, "Collisional stripping of Mercury's mantle." Icarus 74 (1988): 516-528. ↑ A. G. W. Cameron, "The partial volatilization of Mercury." Icarus 64 (1985): 285-294. ↑ S. J. Weidenschilling, "Iron/silicate fractionation and the origin of Mercury." Icarus 35 (1987): 99-111. ↑ P. H. Schultz and D. E. Gault, “Seismic effects from major basin formations on the moon and Mercury.” The Moon 12 (1975): 159-177. ↑ D. Dzurisin, "The tectonic and volcanic history of Mercury as inferred from studies of scarps, ridges, troughs, and other lineaments." Journal of Geophysical Ressearch 83 (1978): 4883-4906. ↑ T. Van Hoolst and C. Jacobs, "Mercury's tides and interior structure." Journal of Geophysical Research 108 (2003): 7. ↑ M. A. Slade, B. J. Butler, and D. O. Muhleman, "Mercury radar imaging - Evidence for polar ice." Science 258 (1992): 635-640. ↑ K. Rawlins, J. I. Moses, and K. J. Zahnle, "Exogenic sources of water for Mercury's polar ice. " DPS 27 (1995): 2112. ↑ D. M. Hunten, D. E. Shemansky, and T. H. Morgan "The Mercury atmosphere." Mercury (A89-43751 19-91) (Tuscon, AZ: University of Arizona Press, 1988), 562-612. ↑ T. Spohn and D. Breuer, "Core composition and the magnetic field of Mercury." AGU Spring Meeting 2005. ↑ A. C. M. Correia and J. Laskar, "Mercury's capture into the 3/2 spin-orbit resonance as a result of its chaotic dynamics." Nature 429 (2004): 848-850. ↑ F. Espenak, Twelve year planetary ephemeris: 1995 - 2006. NASA Reference Publication 1349, 2006. Retrieved May 2, 2013. ↑ JHU/APL, “Mercury and ancient cultures.” Retrieved May 2, 2013. ↑ 16.0 16.1 J. A. Dunne and E. Burgess, “The voyage of Mariner 10 - Mission to Venus and Mercury.” NASA History Office publication SP-424, 1978. Retrieved May 2, 2013. ↑ R. W. Sinnott and J. Meeus, "John Bevis and a rare occultation." Sky and Telescope 72 (1986): 220. ↑ E. S. Holden, "Announcement of the discovery of the rotation period of Mercury [by Professor Schiaparelli]." Publications of the Astronomical Society of the Pacific 2 (1890): 79. ↑ G. Colombo, "Rotational period of the planet Mercury." Nature 208 (1965): 575. ↑ R. F. Dantowitz, S. W. Teare, and M. J. Kozubal, “Ground-based high-resolution imaging of Mercury.” Astronomical Journal 119 (2000): 2455-2457. Retrieved May 2, 2013. ↑ NSSDC Master Catalog Display: Mariner 10. Retrieved October 20, 2005. ↑ MESSENGER Engine Burn Puts Spacecraft on Track for Venus SpaceRef.com, 2005. Retrieved May 2, 2013. ↑ 23.0 23.1 Countdown to MESSENGER's Closest Approach with Mercury Johns Hopkins University Applied Physics Laboratory, January 14, 2008. Retrieved May 2, 2013. ↑ MESSENGER Gains Critical Gravity Assist for Mercury Orbital Observations MESSENGER Mission News, September 30, 2009. Retrieved May 2, 2013. ↑ "NASA extends spacecraft's Mercury mission". UPI, November 15. 2011. Retrieved May 2, 2013. ↑ Ed Grayzeck, MESSENGER Web Site, Johns Hopkins University. Retrieved May 2, 2013. ↑ ESA Science & Technology: BepiColombo. Retrieved May 2, 2013. Planets - Mercury — A kid's guide to Mercury. This page was last modified on 17 September 2018, at 21:38.